Crafts made with kids are some of the best things to display during the holidays. I still have ornaments and wall hangings that I made as a child, thanks to my mom saving them all these years. And I’m certainly going to save things my own children have made, especially if they are as cute as this kids Christmas craft idea. 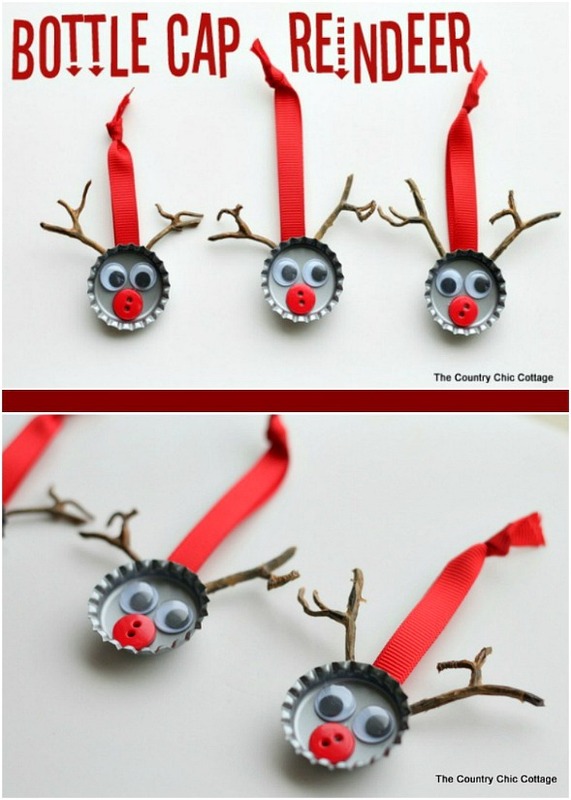 Using recycled bottle caps, you can make some adorable reindeer with your children to hang on your tree. 100 Days of Homemade Holiday Inspiration continues with Day 68! Each day we are inspiring you with recipes, decorating ideas, crafts, homemade gift ideas and much more! If you don’t have buttons laying around the house, small red pom poms would work, too. Or even a small piece of red modeling clay rolled into a tiny ball. These will look so cute hanging from your tree or off a bow tied to a gift you are giving out this holiday season. Thanks to Angie from The Country Chic Cottage for sharing this darling Kids Christmas Craft Idea with us for our 100 Days of Homemade Holiday Inspiration! Thanks for having me Liz!